30 to 39 years of age: 1.5mg at bedtime. 40 to 49 years of age: 1.5mg to 3mg at bedtime. 50 to 74 years of age: 3mg at bedtime. 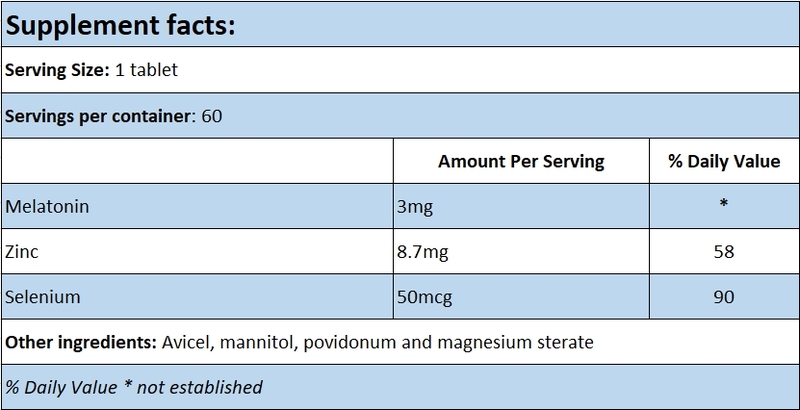 Above 75 years of age: 3mg to 6mg at bedtime. Directions: Take half to one (maximum two) 3mg tablets at bedtime only, ideally between 10 PM and 11 PM. Only use Melatonin Zn-Se ® when you are prepared to sleep and have the light switched off, this is because light entering the eye destroys Melatonin or as directed by a medical health professional. Note: Keep in cool, dark conditions, out of the reach of children and consume before the end of the expiration date. Not for use by pregnant or lactating women. Warning: Whilst melatonin has not shown any toxicity in studies, we do not recommend that this product should be given to healthy children (who already produce it in abundance), pregnant women and lactating mothers or nursing (since no one knows how excessive exposure to the hormone might affect a foetus or infant); people with severe allergies or autoimmune diseases (Melatonin could exacerbate such conditions by stimulating the immune system); people with immune-system cancers such as lymphoma or leukaemia (for the same reason) unless specifically prescribed by a physician. Women trying to conceive should also think twice about taking the hormone, since high doses can act as a contraceptive. Side Effects: A small number of users experience varying degrees of mild headaches and morning grogginess; however this is rare and can often be overcome by reducing the dosage. With Melatonin MZS You Really Can Enjoy A Sound Night’s Sleep. Effects of melatonin in Age-Related Macular Degeneration. "Within 6 months 90% of the trial participants had improved their AMD(age-related macular degeneration ) condition. The improvements continued until the trial ended at 24 months." Age-related macular degeneration (AMD) is the leading cause of severe visual loss in aged people. Melatonin has been shown to have the capacity to control eye pigmentation and thereby regulate the amount of light reaching the photoreceptors, to scavenge hydroxyradicals and to protect retinal pigment epithelium (RPE) cells from oxidative damage. Therefore, it is reasonable to think that the physiological decrease of melatonin in aged people may be an important factor in RPE dysfunction, which is a well known cause for initiation of AMD. Our purpose is to explore a new approach to prevent or reverse AMD. We began case control study with a follow-up of 6 to 24 months. One hundred patients with AMD were diagnosed and 3 mg melatonin was given orally each night at bedtime for at least 3 months. Both dry and wet forms of AMD were included. Fifty-five patients were followed for more than 6 months. At 6 months of the trial, the visual acuity had been kept stable in general. Though the follow up time is not long, this result is already better than the otherwise estimated natural course.1,2 The change of the fundus picture was remarkable. Only 8 eyes showed more retinal bleeding and 6 eyes more retinal exudates. The majority had reduced pathologic macular changes. We conclude that the daily use of 3 mg melatonin seems to protect the retina and to delay macular degeneration. No significant side effects were observed. US National Library of Medicine National Institutes of Health ». Melatonin Zn Se and Age Related Macular Degeneration. Disclaimer: Please note that only your own physician can determine your precise needs, but in order to give you some information these answers are based upon the ‘average person’. Can melatonin reduce let lag? Does melatonin have that morning-after hangover effect of sleeping pills? Can melatonin help people fall asleep faster and sleep more soundly? In our bodies, melatonin is the molecule naturally produced within the pineal gland, the glandular organ nestled between the cerebral hemispheres that the great French philosopher Descartes once proposed to be the "seat of the soul." We find melatonin everywhere in the biological world, from unicellular organisms to the vertebrates. Melatonin is the “Master Hormone-Modulating Molecule” but it is misleadingly called a “hormone.” This is because it is the body’s regulator of all hormones, the molecule which controls the production of almost every other human hormone. Melatonin also helps regulate our “sleep/wake”, or circadian cy-cles. Melatonin’s main job in the body is to regulate night and day cycles or sleep-wake cycles. Darkness causes the body to produce more melatonin, which signals the body to prepare for sleep. Light decreases melatonin production and signals the body to prepare for being awake. Some people who have trouble sleeping have low levels of melatonin. It is thought that adding melatonin from supplements might help them sleep. If flying eastward, you need to go to sleep earlier and get up earlier. If flying westward, you need to stay up later and sleep later. For the first few days after crossing multiple time zones, you are likely to be both sleepy during the day and restless at night. Taking melatonin at the right time may help jet travelers adapt faster. Timing is critical. If you take melatonin at the wrong time, your body clock may travel in the wrong direction. You might leave New York en route to Paris, for instance, but send your body clock to Honolulu. While timing, dosages, and length of use are still being worked out, reducing jet lag is the best-tested application for melatonin, and it may be among the safest, as low dosages are taken for only a few days. The plan below has been used in several studies without causing serious side effects. It assumes that the goal is to sleep during normal nighttime hours at the travel destination. On the day of departure, between 6 and 7 p.m. on home time, on the flight if necessary, a dose of melatonin is taken. Cautionary note: melatonin may lower alertness. If it is taken before departure, the traveler should not drive himself or herself to the airport. On the day of arrival, melatonin is taken at the new local bedtime and continued for four days. If the stay is less than four days, and travel is going to continue further in an eastward direction, melatonin is taken between 6 and 7 p.m. the day before departure, not at bedtime. Melatonin offers little or no advantage on trips of fewer than five time zones westward. The body normally takes only a day or two to adapt to such changes. When crossing more than five time zones westward, starting on the day of arrival, a dose of melatonin is taken at local bedtime, and continued for four days. Read “Melatonin Zn Se and Age Related Macular Degeneration“, an article which gives far more detail about this incredible new research here. Melatonin induces sleepiness and lowers body temperature slightly, perhaps a further aid to sleep since temperature normally falls around the time sleep begins. Several small studies of individuals suggest that some people with trouble falling asleep and/or staying asleep may benefit from taking melatonin at bedtime. However, there have been no large-scale controlled studies as yet. Responses vary considerably between individuals. Again, one should start with the lowest possible dose, and monitor responses and increase doses, if necessary, under a physician's supervision. People who have trouble falling asleep at a conventional bedtime - often staying awake until 3 a.m. or later - but then sleep well may have a disorder of sleep timing called the delayed sleep phase syndrome. Taking melatonin two hours before their current bedtime may help them fall asleep earlier. They would gradually move back the hour they take melatonin until they reach their desired bedtime. Other people have the opposite problem. They cannot resist falling asleep earlier than a conventional bedtime: 9:00 p.m., for example. They then may awaken fully alert around 3 a.m. and be unable to fall back to sleep. Some people with this problem, called the advanced sleep phase syndrome, benefit from taking melatonin if they awaken between 2 and 5 a.m. Persons who are totally blind (lack all light perception) may notice cyclic trouble staying alert during the day and sleeping at night. Because synchrony of daily rhythms ordinarily requires daylight exposure, their melatonin secretion pattern may not be anchored to the normal 11 p.m. to 7 a.m. rest period. In experimental studies, tests of blood, saliva and urine have been used successfully to track the melatonin rhythm, determining when it is in synchrony with the desired bedtime. With this information, blind persons may be advised to take melatonin at bedtime from then on to keep their body rhythms in line. One impressive study of a series of cases of totally blind children with irregular sleep patterns, including daytime sleep, found major improvement when they were given melatonin at bedtime. People who live in at a northern latitude and/or spend most of their time indoors with little daylight exposure also may suffer from a disturbed sleep/wake rhythm. Elderly persons who live in nursing homes or other institutions may be most susceptible to this problem. Taking melatonin at an appropriate bedtime may help provide stability, but concerns about possible interactions with other medication, especially in the elderly, demand caution. As yet, there have been no studies testing the effect of melatonin in demented elderly persons. For healthy young adults with normal sleep, there are probably no benefits from taking melatonin, but there may be dangers in long term use. Insomnia is a symptom of many disorders, including neurological and other medical disorders and psychiatric problems, and requires evaluation by a physician. Melatonin may not be an appropriate treatment. Age-related macular degeneration (ARMD) is the leading cause of severe visual loss in older people, indeed it is the main cause of central vision loss (blindness) in the USA today for those over the age of fifty; (Source: American Academy of Ophthalmology). Macular degeneration is a condition whereby the light sensing cells in the eye’s macula malfunction and eventually they cease to work. Often individuals with macular degeneration will notice that straight lines, such as poles, walls or wires appear to be wavy; other symptoms can include blurred text, often with dark or even empty spaces that may block the center of the field of vision. Fortunately, macular degeneration rarely results in complete blindness since side vision is usually unaffected, but even so because of its propensity, it has been estimated that more than a million people worldwide are completely blind because of advanced ARMD! ARMD makes activities that require sharp vision such as reading or driving very difficult. A test to determine the presence of ARMD uses something called an Asmler grid. This involves starring at a center dot to see if the lines around it are affected by blurriness, waviness or even are out of vision altogether. You can test yourself by following this link. It is not clear how or why ARMD is triggered, although the main focus has been on the hardening of arteries that supply the retina at the back of the eye. Over time this deprives the tissues of oxygen and other nutrients that help it to protect itself and to thrive, the consequence of which is a gradual deterioration of vision. The central part of the retina contains a yellow pigment called macular pigment, this helps to protect the receptors in the retina from sunlight, especially from the harmful effects of blue light. The lessening of the density of this protective pigment can be linked to poor diet and in those who smoke, thus its protection from free radical damage and its enrichment are also seen as a key to ARMD. Physicians classify ARMD into two parts, namely wet and dry. The wet form affects about 15% of patients with ARMD. This form differs from the dry type in that there is a growth of abnormal blood vessels under the retina. This can lead to bleeding and scarring and results in a more rapid and severe progression of the disease (when compared to the dry form). Luckily for about 70% of patients with the wet form of ARMD they can be treated with laser photocoagulation to help stabilize the vision, or to limit the growth of further abnormal blood vessels. So whilst the dry form affects 85% of patients with ARMD and thankfully is less progressive and not as severe as the wet form, unfortunately to-date there have been no successfully reported treatments in regard to the reversal of this condition. Presently most treatments for all ARMD’s have relied heavily upon supplementing with nutritional elements, particularly lutein and zeaxanthin to alleviate, slow down and sometimes halt its progression. Now a new study; (Changxian Yi et al, effects of melatonin in age-related macular degeneration, Ann NY Acad Sci, 1057:384-392) gives hope to millions with ARMD. Dr. Changxian Yi studied 100 patients over a period of 2-years to see if treatment with tablets of Melatonin Zn Se ® (so called because it also contains zinc and selenium in addition to melatonin), could help the condition of ARMD. The approach was very simple; firstly the patients were diagnosed with ARMD, with both the wet and dry forms included. Then 3 mg of Melatonin Zn Se were given orally each night at bedtime for a minimum of 3 months, with 55 patients continuing on for more than 6 months and some onto 12 and 24 months. The patients were then evaluated at regular periods to measure the extent of their ARMD. The study reported that at 2-3 months of treatment the visual acuity had been kept stable, (in other words there appeared to be a halting of the progression of ARMD in general). It is worth noting that although this follow up time is not long, this result is already better than the otherwise normal course that could be expected. For the patients who continued onward past 6 months and onto 12 months of nightly use of 3mg Melatonin Zn Se the change in their fundus pictures were remarkable, (please note the before and after eye pictures presented within this article in figures 1-3). Figure 1(above): The left slide shows the eye of a 67 year old male before treatment, his vision had been deteriorating for 2-years. The right picture shows the same eye 2-months later after daily ingestion of 3mg Melatonin Zn Se tablets. He now has stable visual acuity of 0.3 with remarkable improvements in sub-retinal macular hemorrhage. Figure 2(above): The left slide shows the eye of a 71-year old female with ARMD who after 6-months of 3mg Melatonin Zn Se daily had her vision improve from 0.2 to 0.4 (as indicated in the right slide). Figure 3(above): A 58 year old male whose visual acuity at the start (left slide) was 0.2. This improved to 0.4 after 6-months of regular use of Melatonin Zn Se. The sub-retinal hemorrhage and exudate was remarkably absorbed. At the end of the study, of the original 110 eyes tested only 8 eyes showed more retinal bleeding and 6 eyes more retinal exudates, the vast majority had dramatically reduced pathologic macular changes. This was made self-evident by the patients themselves reporting better vision and general ocular experience with improvements to flare, dryness, clarity and comfort. Whilst the authors called for larger studies to confirm their findings, they concluded that; “melatonin supplementation among the aged population may be beneficial in preventing, relieving or reducing the severity of ARMD, which is one of the leading causes of blindness in the elderly.” What’s more during the entire period (with some patients taking the 3mg tablets every night for 2-years) no significant side effects were observed. Warning: Do not use beyond expiration date. Best if used within 6 months after opening.If you are pregnant, nursing, or taking any medication, consult your doctor before use. Discontinue use and consult doctor if any adverse reactions occur. Not intended for use by person under the age of 18. Keep out of reach of children. Store in a dry place and avoid excessive heat. Excellent product and excellent delivery! My husband uses these to retard the macular degeneration. We used to use the original formula, but out of stock, so this is another good product. Seems to also help him sleep. This has helped me a lot with my sleep disorder, anyone who has the same problem as me, buy this product! It will help you! MZS helps bring on that deep sleepy feeling<br>and waking up refreshed. Better than any other<br>Melatonin product I have taken. Binding melatonin<br>with zinc and selenium seems to make a big difference<br>in releasing melatonin at just the right time to rebalance<br>our circadian rhythm for optimal sleep and recuperation. I have dry ARMD and have been taking MelatoninMZS000 <br>(Dr. Pierpaoli's original formula) for 6 months. I have just been to my optometrist for a scan to check my condition. The scan shows signs of reversal! My quality of sleep has also improved but my motivation for taking MelatoninMZS000 was for the benefit of my ARMD. I will be checked again in 6 months and will provide a further update. I have no hesitation in recommending this melatonin supplement which I have only ordered from Vita-Stream as it is the original formula. Greatly helps with sleep, so it is a helpful product. It works and helps with macular degeneration too!<br>Great product, great service and prices. Will be a regular<br>customer.<br>Thank you. I've switched to VitaStream for this product because of the quantity pricing, free & fast shipping, and periodic discounts. Previously, I've been ordering from a UK source for years and in large quantities on behalf of my family and friends. I'm 65 and I take only Dr. Pierpaoli's formulation of MelatoninMZS000 for the health-promoting, anti-aging qualities (including sleep-aid). Who ever wants to buy this, buy this becasue it helps and is a great price.